You will be given a reference e-book to read which has 382 pages And the test will be based on that e-book , you can take final test within 1 year of purchase. Technical writing is one of the many forms of technical communication. It is a writing style which is now utilized in various fields including computer software and hardware, chemistry, engineering, consumer electronics, aerospace industry, finance, biotechnology and robotics. It can also be defined as a comprehensive field in communication which shows vital characteristics including communication based on specialized and technical topics such as medical procedures, computer applications and environmental regulations, communication utilizing technological applications including help files, social media sites and web pages and offering instructions on how to do something linked to technology. If you want to become a certified writer in the technical field, then you have to improve your skills in determining your audience, finding the write sources for your write-ups and determining your deliverable. A professional technical writer should also become aware of the three vital characteristics of an effective technical write-up and these characteristics are clear, complete and concise. It should also be noted that technical writing involves the extensive use of computers and any other equipment for electronic communications in order for the writers to smoothly perform their work. Writers in the technical field also perform their work regularly with the help of publishing software and different authoring environments in order for them to directly prepare materials that can be published online. Most of the time, technical writers use graphic design, word processing, multimedia software and page layout. Note that technical documentation is also divided in three major types and these include end-user assistance, traditional technical documentation and marketing communication. If you have a strong passion in creating write-ups related to the technical field, then it is best if you take up the technical writing course offered by Brainmeasures. 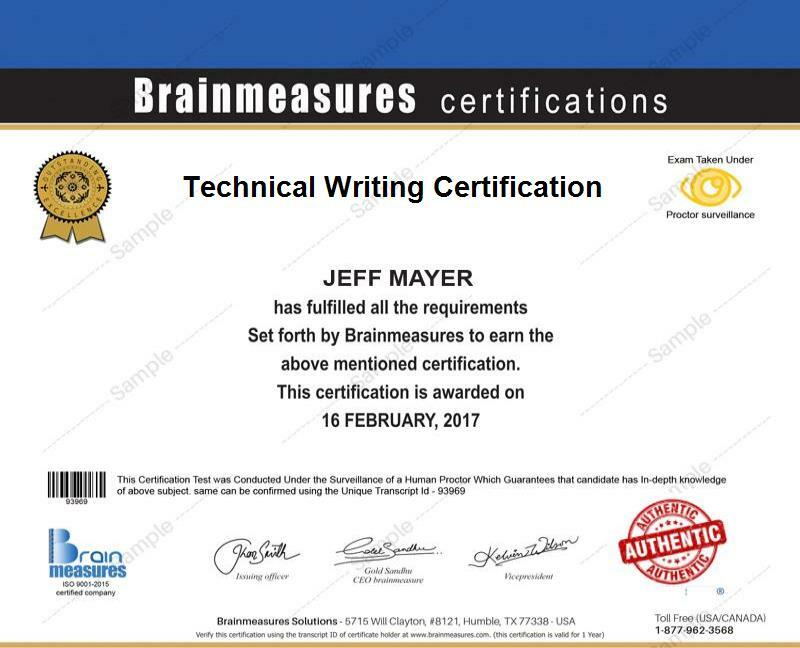 This is a wise move since Brainmeasures is already certified by ISO and this makes all its programs including the technical writing certification program reliable and worthy of your trust. This reliable online certification course offered by Brainmeasures is guaranteed to help you become more familiar about the different strategies that you can use in technical writing as well as the equipment and other technical instruments that can help you perform all your functions in a smoother and more efficient manner. The technical writing exam is one of the most essential parts of the technical writing certification program offered by Brainmeasures as this aims to evaluate what you have learned. A passing percentage is very rewarding since this will allow you to finally receive your technical writing certificate. Brainmeasures technical writing certification program aims to help those who want to become a professional and expert technical writer. This certification program is a good choice for those individuals who want to become more familiar about the procedures involved in effectively communicating technical instructions and information to others and those who are planning to enter the technical writing field by creating more concise and clearer papers or manuals. Earning a substantial amount of income is never impossible if you have finally received your technical writing certification. The average annual salary for technical writers is actually around $61,000. If you get a technical writing position in high-tech companies such as Cisco and Oracle, then expect your earnings to range from $85,000 to $95,000 per year. If you work on an hourly contract, then your salary could be around $50 to $60 per hour.